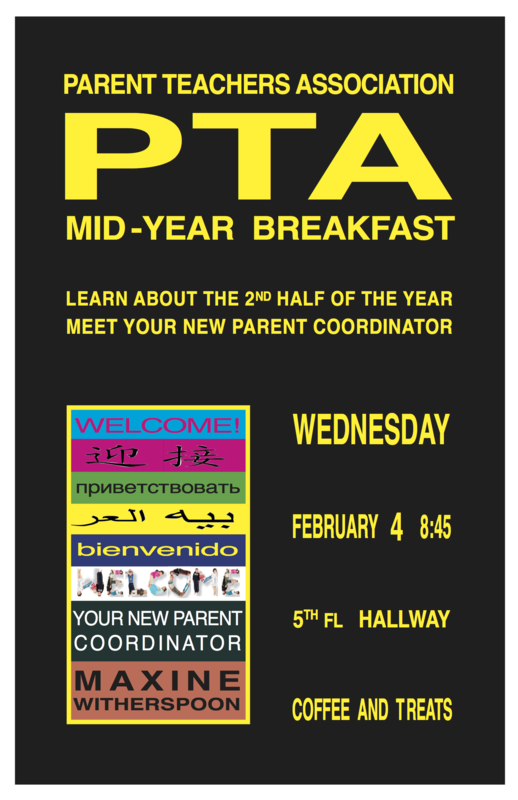 PTA Breakfast Tomorrow: Wednesday 2/4! From MSC Parent: "Missing black winter coat with small blue stripe. It belongs to a 6yr old." Incomplete Immunization Letters are going home today, Tuesday, February 3, 2015. Please check your child's mailbox/backpack. Students with incomplete immunizations will be excluded from school starting Thursday, February 5, 2015. This week, any student who is late due to inclement weather is considered an "excused" lateness BUT it still shows up as a lateness. On the student's transcript, it will show up as an excused "L." It will be coded 07 for Inclement Weather. MSC Parent "missing a black winter coat with small blue stripe. It belongs to a 6yr old. Did someone accidentally take from or near the 1st grade cubby next to the dance studio on the 4th floor on Friday, January 16." If you have any information regarding this missing item, please email info@ps333.org. Thank you. February 3rd: Science Fair Meeting @ 3:00 in 517. February 4th: SLT @ 3:15 in room 519. February 6th: MSC Half Day, students dismissed at 12:00. February 10th: PA Meeting @ 8:45 in auditorium.